Now that's a way to finish a race: at the 50-yard line on the grass at Soldier Field. 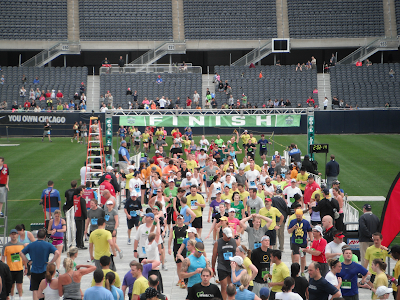 More than 12,000 runners made that a reality this morning at the Soldier Field 10 Mile, Chicago's way of welcoming Memorial Day Weekend. To borrow a phrase used by Fleet Feet when it promotes the race, did you finish on the 50? Time to go enjoy the rest of the three-day weekend.